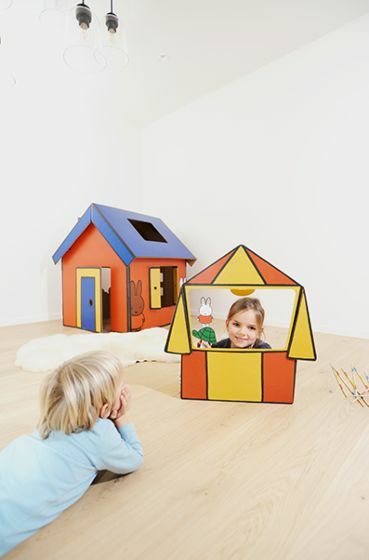 Have the time of your life with your very own cardboard puppet theater. Play with Miffy and her friends and have the greatest adventures together. Let the show begin! Miffy is known around the world as the cute little bunny. Now your kid can act out its own stories with Miffy and her family. Discover the world of Miffy and let your kid's fantasy run wild. Easy to assemble, watch our video tutorial to see how. The puppet theatre is delivered in a cardboard sleeve. Ready to assemble. No tools are needed and all elements* are included, ready for use. Easy to demount for easy storage.